Hi there! How is it going? Now that the CA-Intermediate May 2018 Exams have already began, students appearing for the exam have doubled up their efforts. If you are one of them, you must be relentlessly burning the midnight oil these days. CA-Intermediate exams are part of the revised scheme issued by the ICAI. These exams are being conducted for the first time, so your nervousness is not unfounded. But like always, the CA experts of CAprep18 are around to help you out. We are proud to see the see the students work hard. Keen as we are on guiding you through this crucial phase, we have come up with yet another free webinar on CA Intermediate Paper 5 – Advanced Accounting. In this free webinar, our CA expert talks about how to score good marks in CA-Intermediate Paper 5- Advanced Accounting. The preparation tips listed down in this webinar has been carefully crafted to help you with last minute revision. Thus, this free webinar is a must watch for you if you are appearing for CA-Intermediate in May 2018, and are aiming to score an exemption in Advanced Accounting. Course Contents –When you watch this webinar, you will be able to segment the information in the webinar into three sections. The first section contains a brief introduction of Advanced Accounting. To accommodate the shift from CA-IPCC to CA-Intermediate, the syllabus of this paper has undergone certain changes. And, what better way to kick start the webinar than to discuss the syllabus of Advanced Account for the current attempt? Our expert talks at length about the scope of syllabus in the first few minutes of the webinar. Right from Accounting Standards in Unit 1 to Consolidated Financial Statement in Unit 7, he covers every topic that is important for the students attempting the CA-Inter exams in this attempt. Unit-wise Weightage – Once you have got a grip on the chapters that you should be covering for this attempt, the webinar takes you to the next step. It talks about the weightage to be assigned to each unit and the importance of doing a planned revision. You can consider this as the second section of the video. The importance of planned studies – In this part, the CA expert in the video tells you how to plan your revision for Advanced Accounting, now that the CA-Inter exams are breathing down your neck. By now, you already know which topics to prioritize while revising, based on their weightage. The expert in the video also tells how to divide and allocate the time available at hand, so that you can revise the all the important chapters and still have some time left to solve a mock test or two. Importance of Mock Test papers – Our CA expert thoroughly insists on solving at least one mock test paper before appearing for the real exam. And in the video, he tells you more about how solving a mock test paper one or two days prior, can actually improve your chances of clearing. Last minute expert times – Did you know that the first question in the question paper will be a compulsory question? The expert in the video elaborates on how this question almost always comes from the Accounting Standards chapter. He further tells you how referring to numerous study materials can create massive confusion. And, to score more, he tells you, you should solve more and more problems. Rote learning concepts isn’t going to bear much fruit since Advanced Accounting is a practical subject. 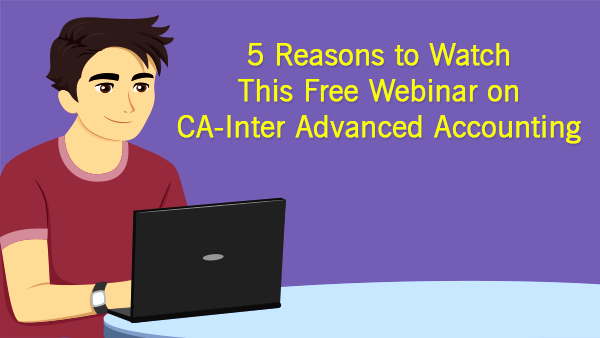 For other such scintillating expert tips and tricks for CA-Intermediate Paper 5- Advanced Accounting, you must watch the free webinar given below. Now that the exams are ongoing, it is quite natural for students to feel pressured. But don’t let exam jitters get the better of you. Stay calm, and just do your best. Also, take good care of your health; the last thing you would want right now is to fall sick before the exams.